Looks like the owner of this c1987 Merkur XR4Ti wanted to take it out for a ride without putting any miles on the odometer, Lol… The XR4Ti, in case you’ve forgotten, was a high-performance German hatchback sold alongside the Merkur Scorpio sedan in American Mercury dealerships (although, not in all of them). It was sold in Europe as a Ford, but it was decided to give the car to the more upscale Mercury brand as a competitor to other German sports sedans like BMW and Audi. 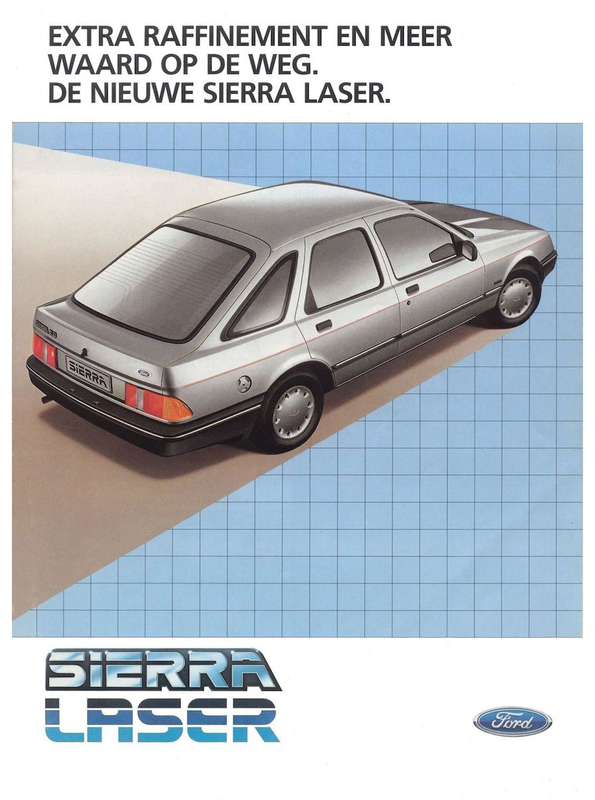 (A tamer four-door version was sold in Europe as the Sierra Laser — bottom photo.) Mercury didn’t sell many Merkurs; it was probably not a good match from the get-go. The cars were rather odd-looking compared to what was seen on American streets, the exchange rate at the time made them very expensive, and the fact that only about 800 Mercury stores signed up to sell them pretty much doomed the Merkur to be a footnote in American automotive history. Sold from 1985 to 1989; this one was seen a couple of summers ago in Albion.